Very small watercolours of the in-between the houses and trees of George Lane, South Woodford. 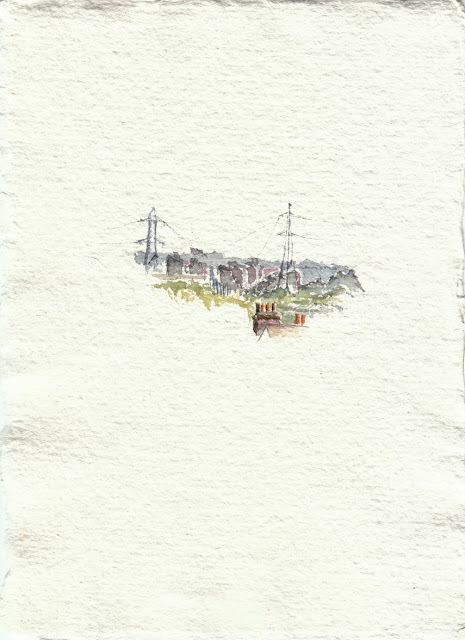 I wanted to take a look at the backdrop to my part of East London, giving it the same scrutiny as if painting a building close up. 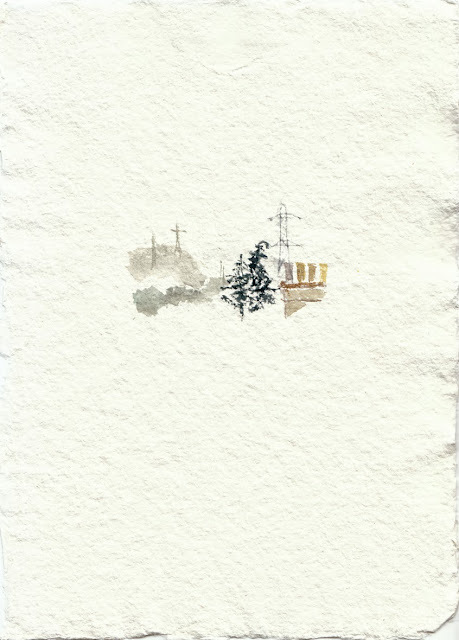 The ill defined becomes the centre of attention; with a touch of foreground to put it in its place. 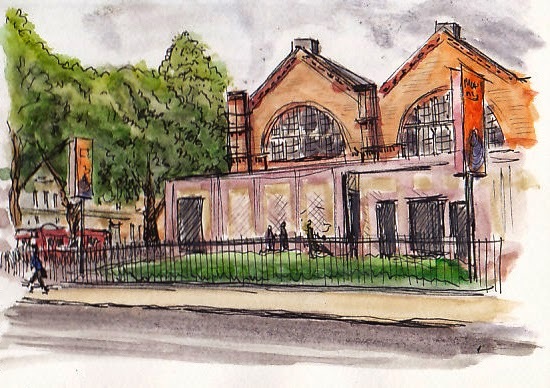 On Saturday the 5th October at 12.00 noon there'll be a few of us urban sketchers outside the Museum of Childhood (right next to Bethnal Green tube station) and we will be meandering our way over to the Geffrye Museum (by Hoxton overground station), sketching anything interesting along the way. It would be great if you could join us! The route is about one and a half miles but there will be plenty of stop offs. Last entry (entry is free) to the Geffrye Museum is at 4pm, so we aim to get there before then, hopefully more like around 3pm. If you want to look around the Childhood Museum before we leave, it would be best to arrive before 12, as we will set off not long after. There's a couple of historical spots and the like along the route, but mostly it's about exploring and seeing what takes our interest! One other thing, if you have one of those lightweight portable folding chairs, it might be an idea to bring it along, as there may not be a great deal of places to sit and sketch. Everyone is welcome, so invite as many people as you like, and don't forget to bring your sketchbook and pencils! 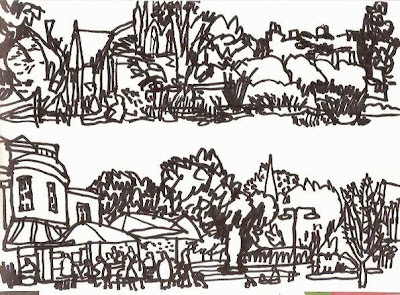 The park at Stoke Newington is worth a visit if you're near these parts. It had a makeover recently and is looking better than ever. This coming Sunday, 29 September, it is hosting events marking the anniversary of the opening of the New River, which passes through the park and was built to bring drinking water to the city from Hertfordshire 400 years ago. I like that it's still called the New River, despite its age and the fact it is no longer functioning as a water supply. Why bother changing it now? 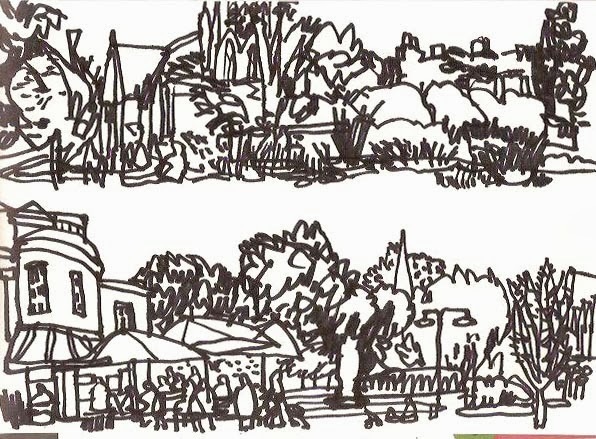 On my full last day in London, I took the tube down to Archway to meet my cousin Dawn Painter for some sketching around Highgate. This was my old neighbourhood before we moved to the States., and I still love it around there. I used to live on Hornsey Lane, a few doors down from the bridge above, Archway Bridge. Of course, this bridge is better known as Suicide Bridge. Unfortunately, it's a name more commonly earned than I realised before I lived there. 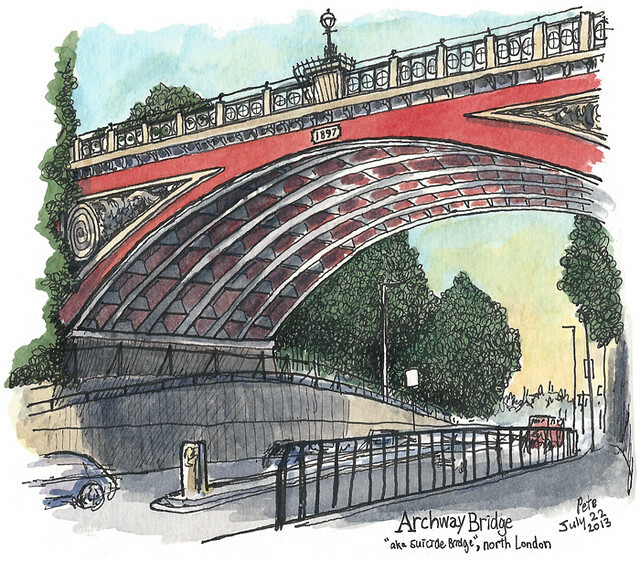 Dawn and I sketched beneath the bridge, beside the busy Archway Road, where the 134 bus charges down on its way into central London. Because I lived higher up Highgate Hill I would not come up this way much, so it was fun to come back and explore a bit more. We popped into one store full of second hand stuff where I saw a full set of Worzel Gummidge dvds. 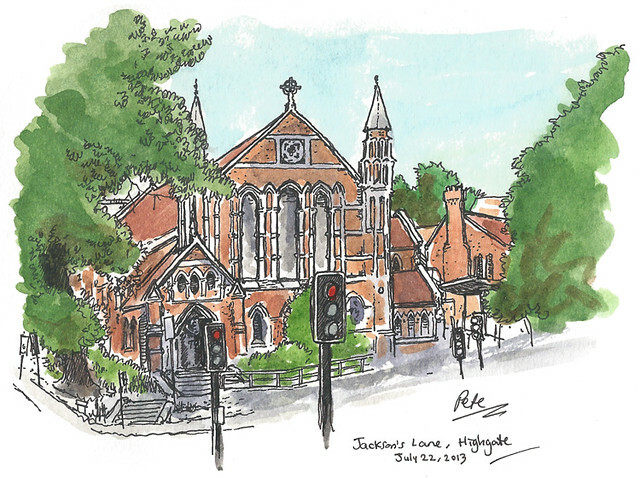 We grabbed a sandwich at Tescos and sat opposite the Jackson Lane building, an arts centre not far from Highgate tube station. We walked further up to Ripping Yarns, an amazing antiquarian bookstore stacked to the brim with wonderful books. Hardly enough room inside to turn around. They specialize in old children's books but also have lots of other books as well. We spent a lot of time in there, I was looking through many of the old annuals, Roy of the Rovers, the Beano, Topper, all those I used to have on my own shelves. 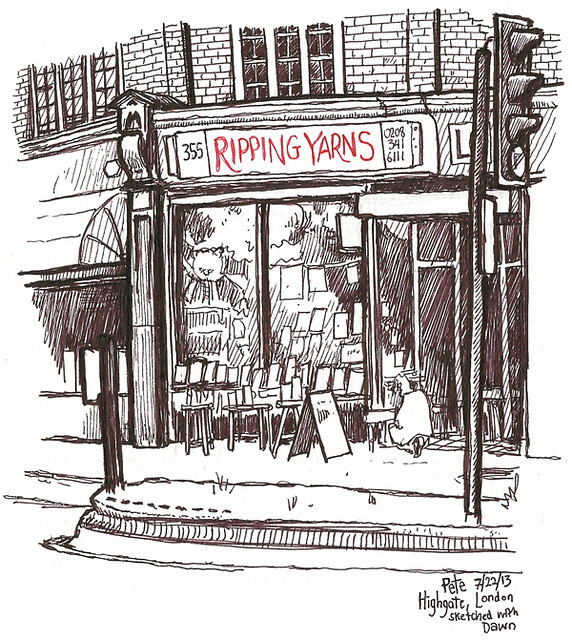 We sat opposite the bookshop and sketched it, and then it was time to go. I had to pack my bags to fly back to America. 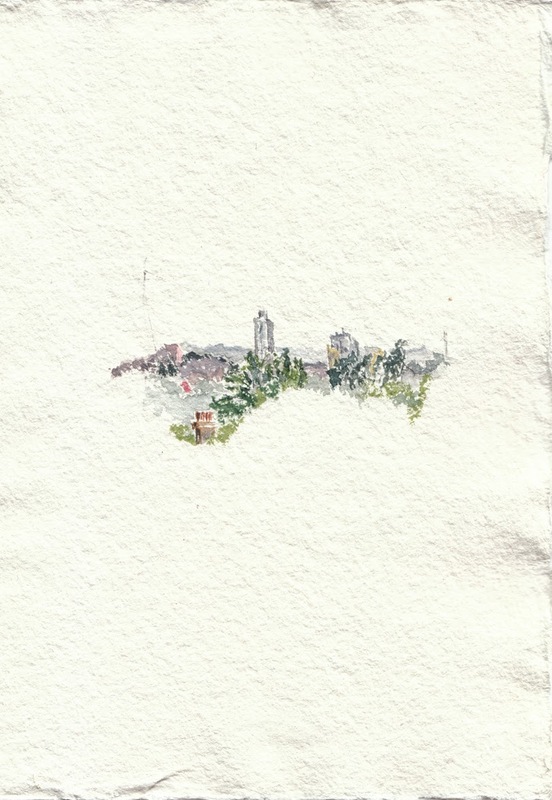 The first recognisable London building I recognised. To a five year old living in the wilds of Suffolk, it was the most exciting thing imaginable. 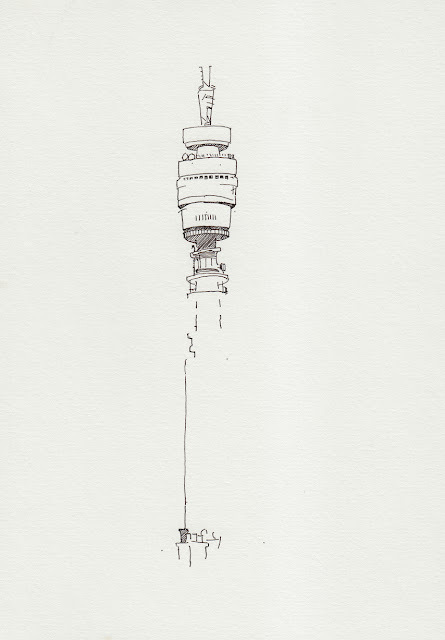 I always look fondly at it when heading down Oxford Street or as today, enjoying it from the fourth floor in John Lewis, where it is seen to rise above a cluster of chimney pots, from a previous century. This delightful piece of Odeon architecture is only a facade. Inside it has been divided into the usual 'screens'; perfectly adequate to view but woefully short on experience. 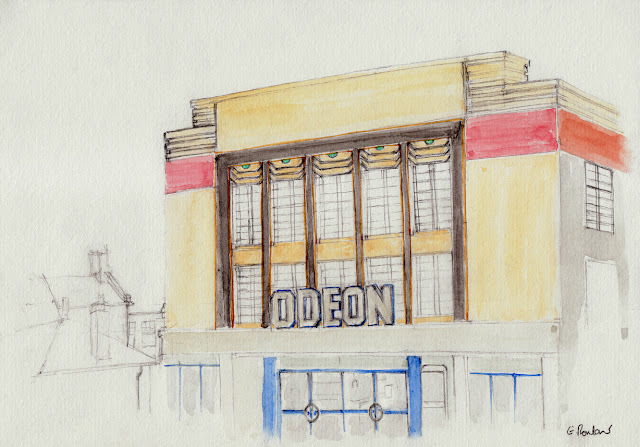 'The pictures' used to be somewhere to go; the building was important. Still, the outside is preserved, at least from the first floor up.